Opportunity: It’s everywhere you look! 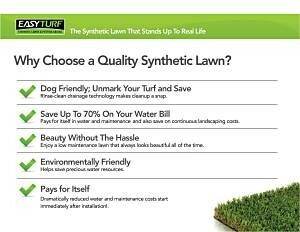 Synthetic grass appeals to a wide range of customers, unlike some products that have relatively limited uses and applications. Besides commercial uses, like golf putting greens, schools, commercial buildings, pet facilities, preschools, childcare facilities, resort pool deck areas, municipal buildings, and even green rooftop projects, we’ve seen rapid increases in installations for residential applications. 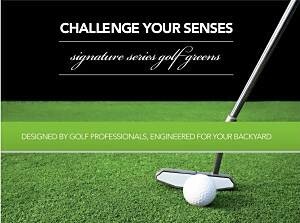 It solves many problems, which mean opportunities to give your clients long term solutions! Partner with innovators, not imitators. 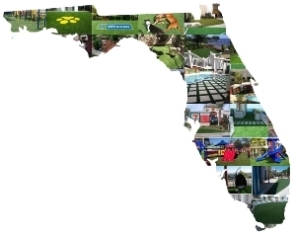 I am your artificial grass and golf putting green specialist, representing Alternascapes, Inc., the Number 1 name in synthetic grass installations in Florida for over 16 years, and based in Sarasota, Florida. 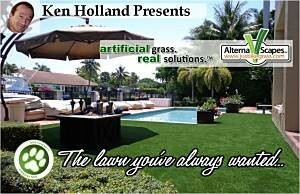 Whether you are looking at a synthetic grass solution for a Commercial or Residential project, you and your client will enjoy white glove service. 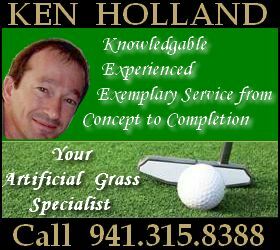 Your highly specialized needs are what we thrive on and we have solutions to provide you. I’ll be happy to discuss your needs, provide schematics and estimate your project. Estimates and design consultations, whether by phone or in person, are free with no obligation. I can work with you, or directly with your client, whichever is best for you. 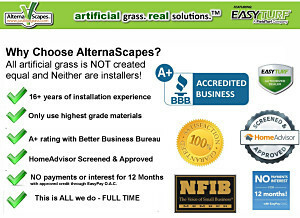 Alternascapes, Inc. – a company who’s uncompromising installation quality, with more than 16 years of commercial, municipal and residential synthetic grass installations throughout Florida – exclusively uses the highest quality artificial grass manufactured here in the U.S, EasyTurf by FieldTurf. 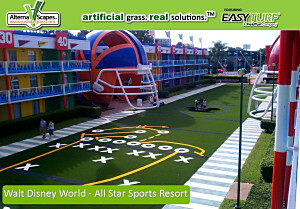 FieldTurf became the undisputed industry leader in sales by creating the ideas that give customers peace of mind with the best product longevity and installation. 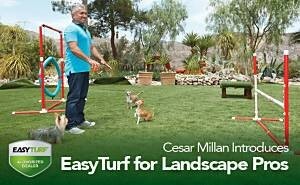 Ideas about how to improve drainage, how to recycle material, how to make synthetic grass more realistic, more comfortable and more affordable. By working with us, your clients will have access to product from FieldTurf’s 450,000+ square foot manufacturing facility in Calhoun, Georgia. 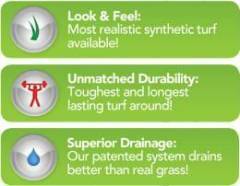 FieldTurf is completely vertically integrated where superior quality controls produce the highest quality synthetic grass available without the middle-man costs. Environmental responsibility and benefits that add up. 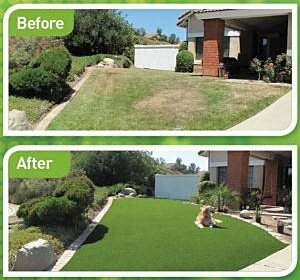 EasyTurf is 100% recyclable and 100% lead free. FieldTurf is continually setting new standards for the industry and is an active, proud member of the U.S. Green Building Council and the EPA’s “Greenscapes” program. Many turf companies claim environmental responsibility and turf recyclability, however they don’t have the facilities or infrastructure to actually recycle the product. This year FieldTurf is pioneering the recycling of its used turf to create infill material and will introduce the first and only synthetic grass available in the U.S. that includes yarn made from recycled materials. Play Now, Pay Later! Limited budgets are a fact of life. Although upfront costs may be slightly discouraging, the immediate safety and long term financial benefits are well worth the investment. With our ﬁnancing plans, your clients, whether Commercial or Residential, don’t have to wait for installations. Have a current project, or would like to receive more information? 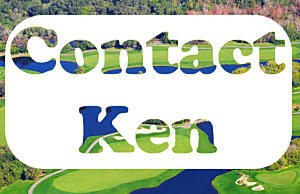 Call me, or use the contact form to the right. Select ‘referral program’ in the subject drop down list. 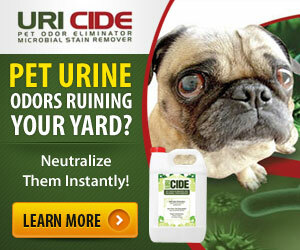 I’ll tell you how rewarding it will be to work with us. Have a website? We can track referrals coming through any source. We’ll be happy to make your web presence much more lucrative by your affiliation with us. Become an affiliate. Start Today.